Heat oven to 375°F. Break taco shells in half; arrange in single layer on ungreased cookie sheet. Bake 5 to 7 minutes. Meanwhile, prepare ground beef with seasoning mix as directed on box. Heat refried beans as directed on can. Layer lettuce, beans, seasoned ground beef, cheese, tomato and salsa on large plate. Serve with warm taco shell halves for scooping. A 10.35-ounce Old El Paso® dinner kit can be substituted for the taco shells, taco seasoning mix and salsa. 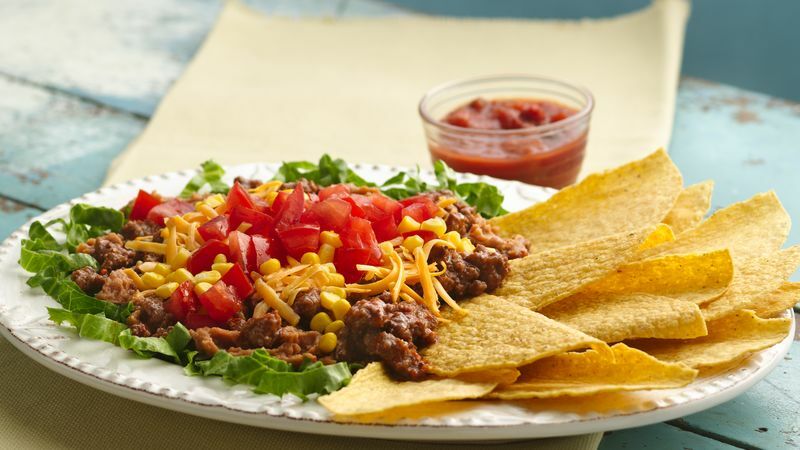 You can substitute the traditional flavored refried beans with any of the Old El Paso® refried bean flavors. Try adding refried beans with green chiles, or even Old El Paso® refried black beans for some delicious variation!